28-Oct-2003 -- I discovered the Degree Confluence Project some weeks before heading off to Turkey for a month and thought this would be our opportunity to contribute to the Project. My GPS rates as one of my favourite toys and where I have used it for many other projects in the past, this one does capture the imagination. Having purchased the best map I could find, I found that 38N 28E was the nearest un-visited Confluence to our little place in Turgutreis (located at the western end of the Bodrum peninsula and opposite to the Greek island of Kos). Having hired a car in Bodrum the previous day, my Turkish wife Ayten and I set out at a respectable hour with the anticipation of finding our first Confluence, and as importantly, the adventure that goes with it. Our journey was during the holy period of Ramazan so the roads were quiet. My past experience of driving on Turkey's roads many years earlier led to caution and I took a local advice on the best route north from Bodrum. Murat, the fellow in the car rental, advised on the easiest roads. Our route to 38N 28E took us NE from Bodrum past the new Bodrum airport (BJV) to Milas. From there, NW and N on the D525 to Söke, we then picked up one of Turkey's newest Toll AutoRoutes to Aydın, a large city in the valley to the south of the Aydın Mountains (Aydın Dağları). I needn’t have worried about the roads, they are fine and we made good progress. We were getting hungry, so stopped for a snack at a roadside Kebabcı located in a large petrol station. After dining on excellent Mercimek Çorbası (lentil soup) and bread, we asked advice on our destination. Even though we knew where we were going, it was interesting to note that locals (as several people were consulted) found it difficult to advise of the road to a village only 20 km from them. It was at this point that we needed to get onto the secondary road that took us north from near Umurlu to Hamamköy, the village nearest, on the map, to the Confluence. We eventually found the road, not as easy as one might think, and started on the run up to the Confluence with the GOTO function the GPS reading 18.2 km to our destination. Conveniently, the road was almost on the 28E line of longitude and due north. We drove though many small villages and rose in elevation as we climbed to over 1200 m. We stopped a kindly old gentleman to confirm that we were on the right road, indeed we were. At this point I should mention the roads once again, having left the new AutoRoute in Aydın for the winding mountains roads of the Aydın Dağları, caution returned. Steep near vertical drops on one side of the road with no safety barriers required care and considerable attention, I reckoned if push came to shove a head on collision was much preferable to any notion of swerving to avoid and going over the edge. Fortunately, we had no problems save careful avoidance of a laden donkey or two, and the local Dolmuş ('stuffed' minibus is the literal translation). The map had few of the villages we passed through on it and the GPS proved it worth in keeping us on track. The count down continued and as we approached to within 1.2 km of the point my heart sank as I could see that the Confluence was located on the other side of a steep valley at about 1 km distance. We stopped on the 38N parallel and looked across to 38N 28E. At first it seemed that this was going to take more time than we had available, however, after having a good squint with the binoculars I could see that there was a dirt road and that access from the other side of the village ahead might be possible. We drove down through the village of Çayırköy and came with 800 m, we were getting closer. A last, as we drove NE outside of the village we found a dirt track leading in the general direction where we parked the car (it's white and visible in the easterly photo). My wife consulted a local fellow regarding access, he wasn't particularly helpful, but we decided to have a go anyway. The track descended down to a river running through well-cultivated area. Vegetables, melons and corn were being harvested by several of the local people and my wife chatted to them and explained what we were doing, not too sure they understood, but they were very friendly and welcoming nonetheless, and beckoned us to go about our business. We passed very old stone dwellings and graves as we followed the GPS to our target. 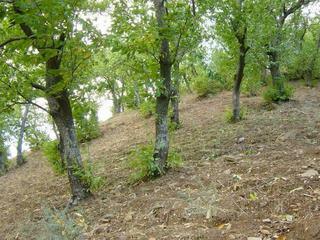 I climbed a steep slope and approached to within 150 m of the Confluence, but was blocked by dense vegetation. Back down to another track, blocked again, at this point, somewhat frustrated, I considered taking a reading and accepting that I might only get within 50 m. However, not easily beaten I took off in the other direction only to find the dirt road we had seen from the other side of the valley. We followed it uphill and reached the Confluence with ease. The Confluence is located in a wooded area on the hillside at a GPS elevation of 680 m and gives views of the village of Çayırköy, but vegetation blocks the views in the other directions. It is an area that has been cultivated for many years with tracks and dry stone terraced patches of land outside of the wooded area. The dirt road up that we took seems to have been widened recently with plastic pipes taking water down to the lower elevations. Having found the dirt road, the access is easily achieved. One note of caution: Very strong winds blew up from time to time making walking difficult, and if darkness approached it could get somewhat hazardous in parts. We had a very pleasant day out to 38N 28E and found a side of Turkey that is not readily seen from the main tourist resorts nearby like Kuşadası. Should you ever be near that way I did recommend you take the time to visit this Confluence.